Nowadays Yemen has a population of about 20 millions people and is a merge, in 1990, between Northern Yemen with a majority of Shiite population and South Yemen, the former British colony of Aden and Hadarmout, with a large Sunnite majority. This merging caused tensions between North and South Yemen and a civil war in 1993. 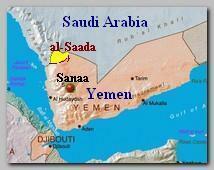 The merging also turned the Shiites in North Yemen to become a minority in their own country. There is, therefore, a constant conflict between the Shiites of the North, 43% from the general population, and the prominent Sunnite Yemeni regime. The conflict deepened after the USA invasion to Iraq in 2003, when the conflict between Sunnites and Shiites and between Arabs and Iranians breached out all over the Middle East (see – YEMEN Insurgency ). Saada province is in Northern Yemen on the border with Saudi Arabia with a population of about 700,000 people, most of them Shiites, is a mountainous region of about 2,000 km, with traditional resentment to the authority of Sanaa, Yemen’s capital. Since 06/2004, violent uprising, led by Hussein el-Deen Houthi and his “Al-Shabab al-Muamin” (The Believing Youth) militia, has taken place in Saada, killing hundreds and causing displacement of about 70 thousands. The conflict has its roots in an insurgency against the government of Yemen which was initiated by a rebel Imam. A ceasefire, brokered in 06/2007, was followed by a peace agreement in 02/2008. By 04/2008, however, the peace process was in jeopardy as each side of the conflict accused the other of failing to implement aspects of the peace agreement. The Shiites were led by Abdul-Malik Houthi, the son of Sheikh Badr el-Deen Houthi, and the brother of the slain cleric Hussein el-Deen Houthi, who was killed in the 06/2004 riots. Abdul Malek Houthi commanded also the “Al-Shabab al-Muamin” militia. On 03/03/2006 the Yemeni President Ali Abdullah Saleh announced general amnesty to 627 Saada Shiite rebels and supporters of Abdul-Malik Houthi in an attempt to restore peace in al-Saada region. Abdul-Malik Houthi himself became known in 2007 when he threatened the Jews in al-Saada province to leave their home otherwise they will be killed. Abdul-Malik Houthi died on 06/06/2008 after he was wounded in clashes with the Yemen army a week earlier.